France 0-2 Mexico Aftermath: French Media Have A Field Day! As you may have picked up on already, the French did a bit of a lose against Mexico in the World Cup last night when they really should have done a win instead. 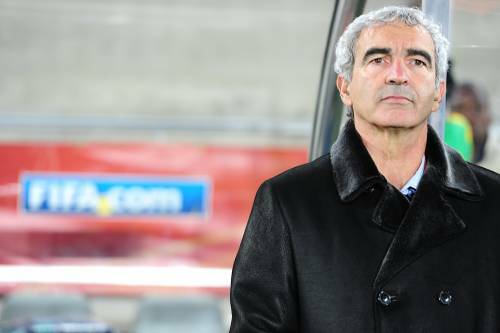 Ambivalent clown (and inexplicably France’s longest-serving coach ever) Raymond Domenech looked on indifferently from the sidelines all night, as his side slumped to a 2-0 defeat against El Tri and their magical trio of substitutes. As you can probably imagine, the French media (who are not exactly renowned for their unwavering support of the national team) had a field day at Domenech’s – and his group of non-plussed players’ – expense. France’s biggest and most well-respected sports daily ran with the headline “Les Imposteurs” – which roughly translates as ‘The Imposters’. Nothing like going out on a high, eh Raymond? I absolutely cannot stand Domenach, much like Sven-Goran he seems to have the emotional range of a tea-spoon, and like Steve McClaren is incapable of a team that can play together. Domenach alone is the reason why France should not have been at this world cup, I guess the consolation comes in the fact that they will be out within a game. Maybe Domenech should’ve taken me along? L’equipe’s editorial staff should emmigrate en masse to Portugal. We need them. We only have bootlickers. I don’t really care what the headlines say, cuz all of them would be justified. I’ve totally had it with this French side. I kept watching their games cuz in my mind they were still a giant in football. But they lost all credibility with my now. I might watch their final game merely to see if they’ll get knocked out. Btw, Anelka has just been sent home. Got a feeling pretty much everyone is just dying to get the hell outta there and go home. There’s pure hate between the coach and certain players. Even a WC win wouldn’t mend that.